Looking for a premium indoor light fixture which has a powerful effect on deterring birds? 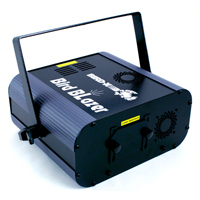 The Bird BLazer Laser Bird Control device safely frightens birds away. This device uses fat-beam laser technology at random intervals in 3 different color combinations birds hate, strongly encouraging them to relocate to less irritating environments. Randomized laser patterns constantly change to prevent acclimation. Convenient remote control provides control access from most locations in the building. Coverage is up to 10,000 square feet. Works day and night (daytime in darker areas, though many choose to just use at night). The Blazer should always be mounted right side up so it is level horizontally (do not mount to a vertical or diagonal surface). Unwanted beams (the beams that would normally point down, for example) can be blocked by adjusting the thumbscrews on the metal “door” covers on the front aperture.